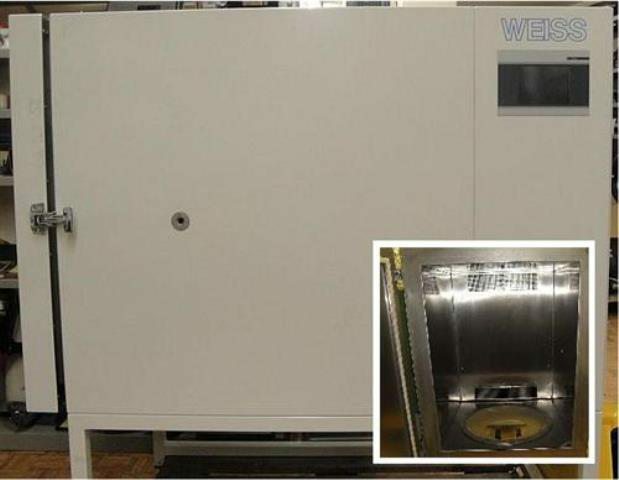 Environmental temperature test chamber for constant tunable temperature tests specially designed for vibration testing allowing the introduction from the bottom of the tested sample. Noise isolation. Huge test space volume. High heat compensation. High ventilated air circulation rate. Polished stainless steel. Graphics-capable display. Volume > 200 L; Temp. range about. to 180° +/-0.1°. Internal Dims (LWH): about 600x800x450 mm; Ext Dim (LWH): about 800x1500x1450(+250) mm; Weight: 200 kg.. Supply: 230V/50 Hz .